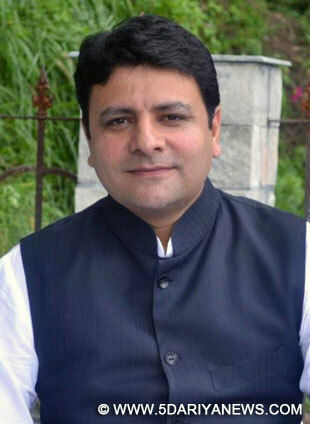 The Urban development Minister of Himachal ,Sudhir Sharma said that the BJP in Himachal has a habit to act in such a way, so that the working of the Himachal Assembly could not work. Sudhir said,”MLA’s of BJP disrupted the working of last three assembly proceedings in Himachal, and they did the same this time too.” Minister said that the voters in Himachal has given the clear mandate to Vir Bhadra lead congress, and we shall continue to work for the 5 years . Sudhir said,”Let them (BJP) do their work and let us work for the development of Himachal.” Sudhir was speaking to PTI at Chola, near Dharamshala, where he visited the land slide affected villagers on Saturday. At least 13 families were rendered homeless after a massive landslide, triggered by incessant rains, struck the small village on 9th August evening. The village is situated at the Indrunag hill, the site identified by the state government for setting up the Dhauladhar campus of the Central University of Himachal.The minister announced a financial help of rs 75,000/- to the each affected family and promised the alternative land pieces.Last year, 26 families were rendered homeless while 15 army buildings were swept in a landslide that occurred at Tihra Lines village near McLeodganj, which also falls in the active sliding zone.